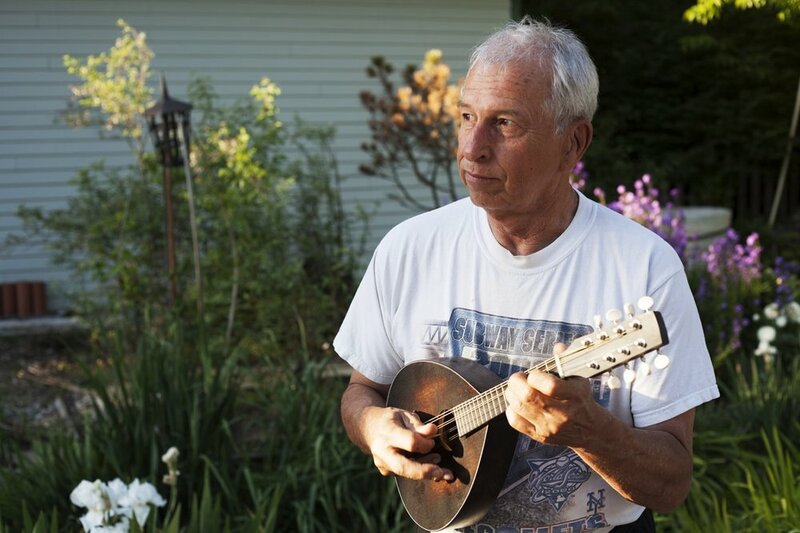 In 1972, Mike bought a banjo that had an oddball neck on it so he and his brother decided to build a new neck for it. The seed was planted about building things. Moving to North Idaho in 1976 he ran into two guys who were building guitars and they hired him. He worked there for five years. Rooming with RL (Bob Givens), Givens mandolins and guitars, he worked off and on with Bob during the slow times at the guitar shop. Post full time building, the next 12 years found him repairing instruments in music stores, gaining much insight into the 'how' instruments were constructed. 1993 found him moving to Missouri where he took odd jobs, one of which was teaching guitar at a local music store. One day, while waiting for a very tardy student, he waltzed over to the banjo and mandolin display. He picked up a brand name mandolin and noticed three things. The price tag of 900 dollars, the fact it was made out of plywood and it had nothing in the way of ‘good tone’. To the garage he went. Starting out alone, he developed what is now Big Muddy Mandolin. Reaching out to one dealer at a time he then created a market via word of mouth. As the mandolins got more exposure and more in demand he began hiring one person at a time until he reached three full-time and two part-time employees. Reaching a total of nearly one thousand mandolins a year. In the past few years, after being the 'manager and CEO' he began to realize his first love was actually building the mandolins himself. Now down to one part-time employee, Mike is doing all the critical work and is limiting production in what he calls ‘a saner workplace’. Actually, he's a lazy guy by nature and isn't afraid to tell you so. PS. Big Muddy Mandolin is fueled by Lakota Coffee’s “Big Muddy Mud” a custom blend coffee bean mix designed by Mike Dulak, guaranteed to get your Big Muddy mandolin/mandola playing up an running! To will oneself to become a notable musician takes an immense amount of time, focus, and perseverance. While anyone can learn how to play a musical instrument, it takes a special breed of person to push the envelope of their craft into the arena of becoming a professional musician. Mike Dulak has garnered praise for his musical abilities. What separates this picker from the vast array of talented music makers in Mid-Missouri is his drive and passion to move beyond the stage and into the workshop as he creates quality handmade mandolins in Rocheport, MO. Dulak has been building mandolins for 22 years. Having spent decades playing in honky-tonks and clubs, he is a seasoned and grizzled musician with the chops to hang with any band you could put him with. Folks in Columbia might recognize some of his hilariously named (but blazingly talented) groups such as The Rank Sinatras and The Boone County Tickpickers. Anyone that has seen Dulak on stage knows that he is just as much a comedian and performance artist as he is a musician. Sometimes, he would refer to himself as Mike Raphone while bantering with the audience (Get it? Microphone?). The shop for his company, Big Muddy Mandolin Company, is nestled in the river village of Rocheport. There, with his trusty Basset Hound Oliver at his side, he meticulously hand crafts each mandolin with great precision and care. Using such exotic woods as koa and purple heart he has created a mandolin that not only looks gorgeous, but sounds great. Handmade mandolins of this caliber could easily cost an arm and leg, but Big Muddy Mandolins are very reasonably priced for the quality of the product. Dulak enjoys the quiet life of living in Rocheport. When he isn’t building mandos, he is hitting the trail with Oliver or playing in senior league baseball tournaments. Don’t let that laidback lifestyle fool you. When it comes to precision of his craft, Dulak never skimps on quality. When the rare occasion in which a client needs a repair, he goes out of his way to help them out. In one instance, a broke college student needed a major repair. When speaking with Dulak, it becomes obvious that this craftsmen is bound, not only by a common love of instrumentation and musical talent, but also by a jovial air of pride in his work. He is a musicmaker in more than one sense and the effects of his passion can be heard echoing throughout the corridors of music venues across the U.S. If you're looking for handcrafted and real wood- you've found it. Shop around!